Despite the nondescript European GP title, Formula One gathered in Germany for the tenth round of the championship last weekend. After the high speed Silverstone circuit and the test at Spa, the Nurburgring is a slower track, which became even slower still at various parts of the race weekend due to the rain. The Nurburgring is a modern circuit in the style of several tracks revised during the late eighties and nineties. As such, it doesn't feature challenging high-speed turns and has several overly tight corners to break up the lap. In many respect the modern Nurburgring is an average circuit on all areas of set-up; downforce, drag, brakes and engine power. Yet as with any track, it does have its idiosyncrasies. It's layout tends the car towards understeer, particularly through the longer corners where car doesn't have the downforce or speed to generate more grip. This makes finding the car's balance more difficult. The few technical developments on the cars aimed either to improve front-end grip or make the car less sensitive to sliding. Due to the demand for mechanical grip in the medium-speed corners and the track improving as the rubber is laid down, Bridgestone was able to run the soft and medium compounds for this race. It was found that in the dry the soft tyres were struggling, the cooler temperatures causing the tyres to grain for an extended period. As a result, most teams planned to keep their race stints on these tyres to a minimum. Of course, the race was interrupted by rain. Since the single tyre supply regulations came into force we have not had a wet race, and this has been the first time for many years we have been able to watch the drivers compete in tricky conditions on equal tyres. During the tyre war, the Bridgestone and Michelin intermediate and wet tyre strategies were very different. Over the past weekend the design of the front axle assembly has been highlighted by both Hamilton's crash and Ferrari's wheel fairings. There are a lot of components hidden inside the wheels. Many are never seen, hidden behind the brake discs and within the expansive brake ducts. Here, we'll aim to explain what's inside the front wheel, how it works and what went wrong in Hamilton's crash. In general layout, a front wheel rotates and steers in the same way as on most road cars. The wheel/tyre is bolted to an axle known as the hub (D - Red). This rotates on a pair of bearings mounted within the upright. The upright mounts to the two wishbones and the pushrod, and from here on, the differences are in the detail. Externally, the most obvious difference is that the front wheel is retained by a single nut. The large nut (C - Blue) is tightened by the wheel guns in the pits. This alone should be enough to secure the nut and hence the wheel to the hub, but Formula One also mandates the use of a wheel retention mechanism. Universally this is provided by two pins (B- Yellow) that extend radially from the hub, protruding just outside of the wheel nut. They are extended/retracted by a toggle (A - Grey) on the end of the hub. Mechanics can be seen pulling these toggles out to extend the retainers as their last job when changing wheels in a pit stop. The retainers are relatively small, and will not hold a loose wheel nut on for an extended period of time. There are two methods to stop the nut loosening. Firstly, the threads on the nut/hub are sided so that the rotation of the wheel is more likely to tighten the nut rather than loosen it. Secondly, the nut is tightened to a specific torque setting to ensure that the nut does not work loose. On the inside, the wheel is also retained onto the hub by four drive pins. These ensure that the wheel does not rotate on the hub, so that braking and acceleration loads are transferred between the hub and the wheel. The hub rotates on two large bearings. In recent years these bearings have grown even larger in diameter as the hub is hollowed out to flow air for brake cooling. The angular contact bearings (sometimes ceramic) are an expensive item bought in from specialists. Fortunately, considering their cost, they can last for up to two race weekends. They are mounted inside the upright, and the hub is tightened onto the bearings with a large castellated nut. The upright is commonly made from cast titanium or MMC. Back in the nineties, the upright was a lavishly fabricated part in steel or titanium. The bearings would be mounted in a wire-eroded spoked carrier and the brake and wishbones mounts radiated from the bearing carrier. The aim was to pass the cooling air for the brakes through the spoked carrier. Nowadays, the teams wrap the upright tightly around the bearing and pass cooling air either around the upright to the brakes. The carbon brake disc is mounted to the hub using an aluminum bell (E - Orange). The bell bridges the narrower diameter hub to the inner rim of the carbon brake disc. The bell also serves to divert the cooling passing from the upright to the drillings inside the brake disc - sometimes, the bell has additional drillings to pass some cooling air to the outside face of the disc and brake caliper. Contrary to popular knowledge, F1 brakes do not use any sort of fan to drive air through the brakes. This was a fallacy started when Ferrari first adopted the enclosed brake drums in 2001. These covers are an aerodynamic device, not for brake cooling but to stop air passing through the wheel, so that all flow from the brakes passes out through the outer face of the wheel. Any flow passing through the inner face would upset the sensitive aerodynamics between the wheel and the car. The covers are now so tightly packaged inside the wheel that any run-out of the wheel or problem with the duct results in contact between the pair. For the Red Bull teams, a copper rubbing strip is fitted around the brake duct to help seal the gap and prevent damage to the wheel. In qualifying, Hamilton's wheel nut was not torqued down correctly, although the wheel was secure and the retaining pins extended. This small amount of looseness allowed the wheel to be misaligned with the hub as the car experienced its heaviest loading in the high-speed right-hand turn. The brake duct rubbed with the wheel, giving off the tell-tale smoke before the wheel failed and the tyre came off the rim. 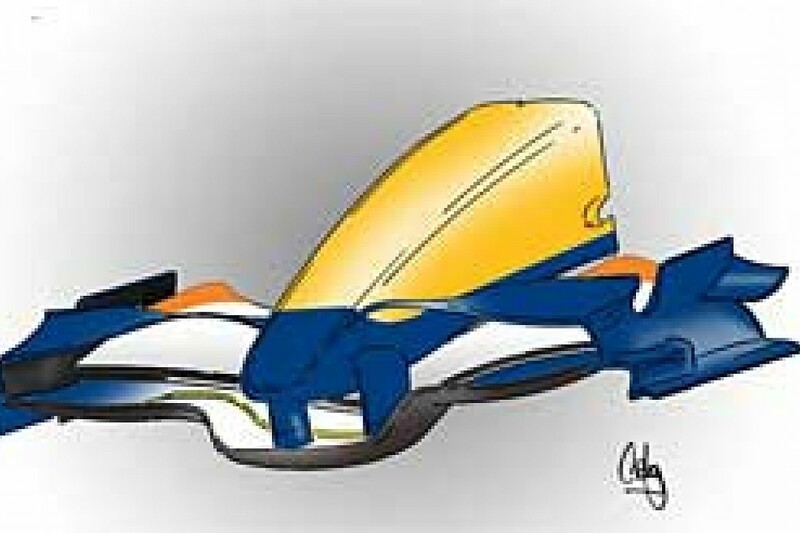 Renault's development to improve the car took another step this weekend with a revised front wing. Originally not intended to debut until Turkey, the wing was rushed through the factory and appeared in Germany untested. The wing's most striking feature is its deeply dipped central section. But the most interesting aspects of the new wing is the use of a slotted main plane. In the middle of the main profile of the wing is a slot (yellow), which effectively turns the two-element wing into a three-element wing in the dipped centre section. This allows the dip to run a steeper angle of attack without separating. Both of these features of the wing are very similar to BMW Sauber's front wing. BMW have run both a slotted profile (albeit on the flap) and a overly square centre section. It is clear that Renault gained some inspiration for their wing. Having run their new rear wing in testing both at Silverstone and Spa, McLaren gave their new rear wing development its race debut at the Nurburgring. 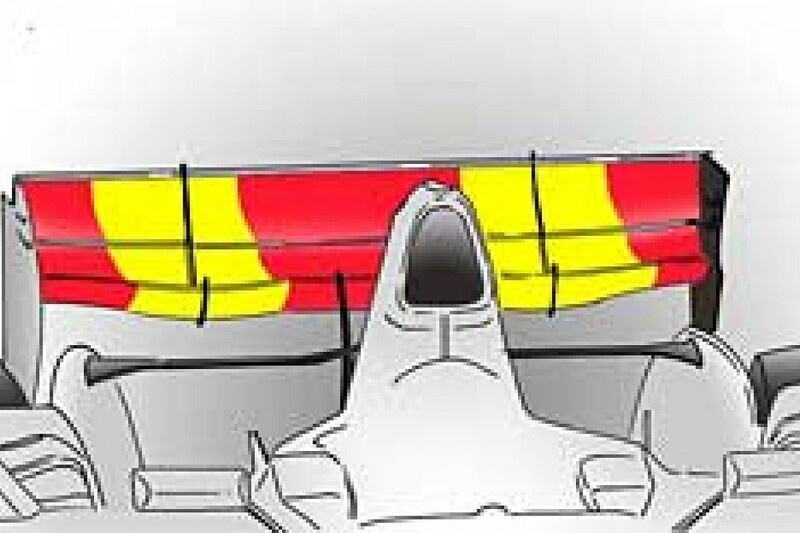 The wing uses a complex rear profile, with two distinct dips either side of the centre line (yellow), leaving the centre span and the outer tips of the wing much shallower in profile. 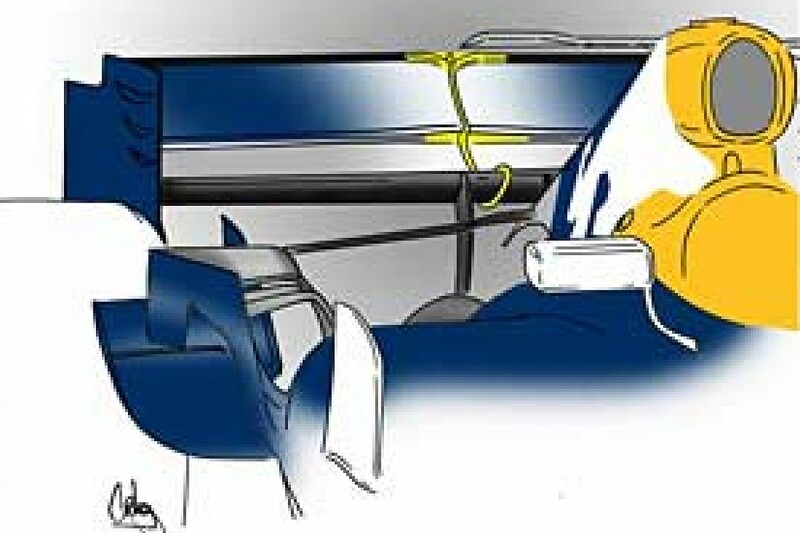 Intuitively, this would mean the wing works best in these dips sections. As important as the wing itself was the deletion of the viking horns from the roll structure. These have been a feature on the McLaren for several years, and their aim is to improve the airflow to the rear when the car is yawing (i.e. sliding at angle to the direction of travel). The tip of the fin gives off a vortex which trails around the blind side of the engine cover and provides the rear wing with more flow. As McLaren have removed these horns, it can be assumed that the new rear wing profile works better in yaw than the usual wing which is dipped in the centre, probably due to the harder working dipped regions which are set away from the car's centre line and hence are less effected by the engine cover masking the flow in yaw. This wing may not give McLaren more downforce overall, but would certainly provide more downforce across a range of attitudes when the car is lapping the track. Fresh from signing ex-Honda technical director Geoff Willis, Red Bull appeared with a new rear assembly. The rear wing sports a largely flat profile, but the detail of the flap is very subtle (yellow). The trailing edge is nipped in at the centre line, making the flap shorter for a small span in this area. Also, the slot gap between the flap and the main plane varies in this centre area, the gap being larger than for the rest of the span. These two features offset each other to some degree, as the smaller gurney will pull less air from under the wing and the bigger slot gap will push more air under the wing. As well as new profiles, the wing gained new endplates, with a square notch cut from behind the flap and three large slits moulded into the leading edge.